The two guardian fish were created circa 1931, after a 17th century sculpture at Nagoya Castle, Japan. 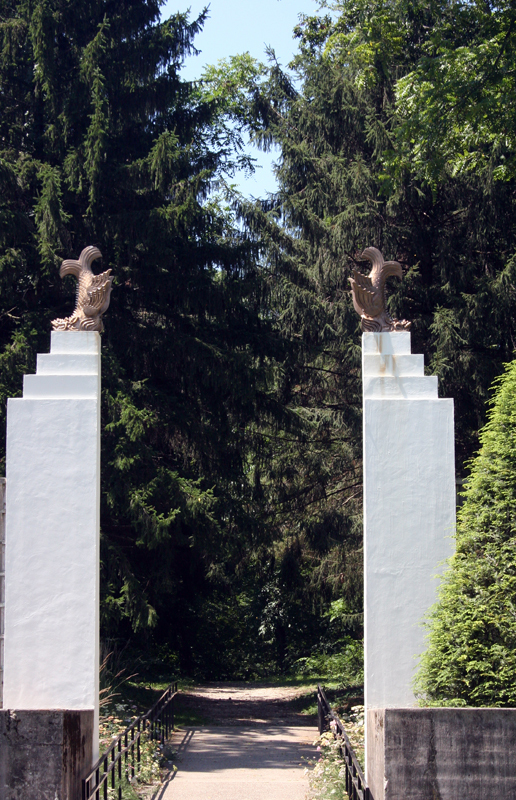 The sculptures are made of bronze, standing at approximately 40" high in the Sunken Garden at Allerton Park. On pylons in the Sunken Garden, looking very much like glittering sea creatures diving into a vast subterranean world, surfaces modeled in wonderful deep and shallow designs, teeth huge and fearsome, are sixteen guardian fish, reduced-scale versions of originals at Nagoya Castle, Japan. Several are recent reproductions necessitated by theft, but most are the original bronzes covered by three layers of gold leaf (now badly worn) that Allerton had made by Yamanaka and Company, Tokyo. Representations of these mythological, scaly-armored aquatic fire protectors, called shachi, were used as roof ornaments in Japanese palaces and castles, and until its destruction in World War II, Nagoya Castle possessed the most famous pair: a male and female mounted atop the high inner tower, first created in the seventeenth century and remade several times, in 1726, in 1827, and again in 1846. (The castle, built ca. 1610, was reconstructed in 1959.) The postwar versions are of copper covered with eighteen-karat gold mixed with bronze, but the nearly nine-foot-high originals were of wood plated with lead and then encased in a layer of gold. These sculptures are located in the Sunken Garden. MurielScheinman, “Japanese Guardian Fish,” ExploreCU, accessed April 18, 2019, https://explorecu.org/items/show/55.